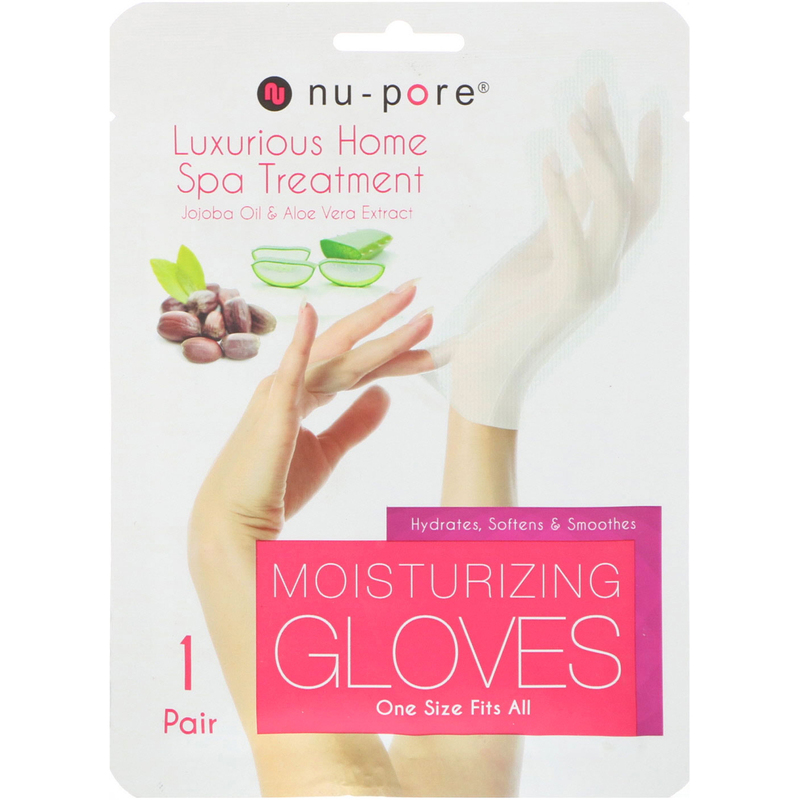 Nu-pore Moisturizing Gloves provide revitalizing and soothing relief for tired, dry hands. This hydrating treatment is enriched with jojoba & aloe vera, leaving skin feeling soft and smooth. Rinse hands thoroughly and completely dry them to remove any moisture. Insert hand in the moisturizing glove and make sure the contents of the liquid are inside. While wearing the hand moisturizing gloves, massage hands to absorb all the liquid. After 20 to 30 minutes, remove moisturizing gloves and massage in the remaining liquid for long-lasting hydration. Water, glycerin, butylene glycol, helianthus annuus (sunflower) seed oil, cetearyl alcohol, butyrospermum parkii (shea butter), isopropyl myristate, urea, betaine, caprylic/capric triglyceride, glyceryl stearate, sodium hyaluronate, portulaca oleracea extract, hamamelis virginiana (witch hazel) extract, aloe barbadensis leaf extract, dimethicone, biosaccharide gum-1, PEG-32, 1,2-hexanediol, carbomer, xanthan gum, allantoin, EDTA 2 na, polysorbate 60, persea gratissima (avocado) oil, melaleuca alternifolia (tea tree) leaf oil, steareth-2, steareth-21, stearic acid, citrus paradisi (grapefruit) fruit extract, fragrance, collagen, simmondsia chinensis (jojoba) seed oil.